Tough races across the board represent another strong year of programming. 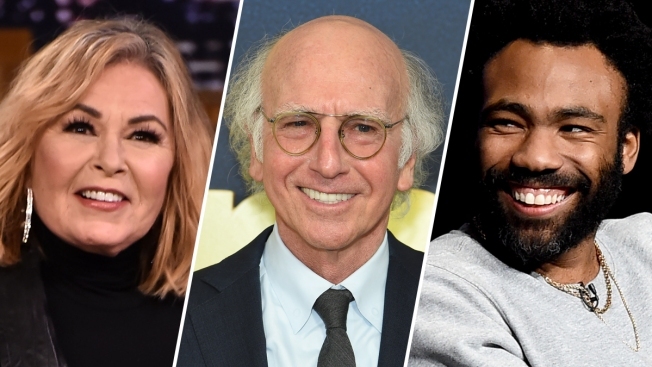 From left to right are comedians Roseanne Barr, Larry David and Donald Glover. David has a nomination for lead acting in 'Curb Your Enthusiasm' and Glover has four nominations in comedy. The Emmy nominations announcement Thursday underscored that the fierce competition in drama ("Game of Thrones" scored a top 22 nominations) and comedy alike (“Saturday Night Live” notched 21 nods) is no laughing matter. That’s the product of another strong year of programming: It’s far easier to argue who shouldn’t have been left out than to decree who didn’t deserve to make the cut. The tenor of the times also plays out, barely cloaked in humor, in the packed late night comedy landscape. Best talk show nominees Samantha Bee, Stephen Colbert, Jimmy Kimmel, Trevor Noah and 2016-2017 winner John Oliver all regularly excoriate a president who has griped about never winning an Emmy. The outlier – and possible beneficiary of a glut of more politically oriented competition - is CBS "Late Late Show" host James Corden, still riding high from his great "Carpool Karaoke" segment with Paul McCartney. Meanwhile, “SNL” snared the most comedy show nominations – including one for Alec Baldwin, who won a supporting actor honor last year for his withering portrayal of President Trump. After 12-year absence, "Will & Grace" picked right up where it left off with its audience – but not with once-smitten Emmy voters, who ignored it for best comedy. Perhaps the returning series concept lost its luster after a racist tweet by Roseanne Barr spurred ABC to cancel once-again ratings grabber “Roseanne,” which only managed a supporting actress nomination for Laurie Metcalf. “Will & Grace” more likely proved a victim of tough competition that includes "Atlanta," whose second season exceeded its outstanding initial outing, and the debut run of “The Marvelous Mrs. Maisel,” which lived up to its title adjective. “Will & Grace” scored nods in the supporting actress (Megan Mullally) and guest actress (Molly Shannon) categories. Two other underappreciated comedies earned nominations for its lead performers – Issa Rae in “Insecure” and Ted Danson in “The Good Place.” Meanwhile, “Late Night with Seth Meyers,” netted a writing nomination. No such luck, though, for “The Tonight Show,” “Conan” and “Real Time with Bill Maher.” The snubs only highlighted the quantity and quality of TV comedy at a time we all could use some laughs. The quirky “At Home with Amy Sedaris” landed in the variety sketch series field alongside the likes of “Portlandia” and “Saturday Night Live.” John Legend got nominated in the other-wise drama-heavy limited series or movie category for his lead role in the musical “Jesus Christ Superstar Live in Concert.” Larry David notched his sixth nomination for playing a version of himself on “Curb Your Enthusiasm,” which, even though he hasn’t won (yet), is still pretty, pretty, pretty, pretty good.